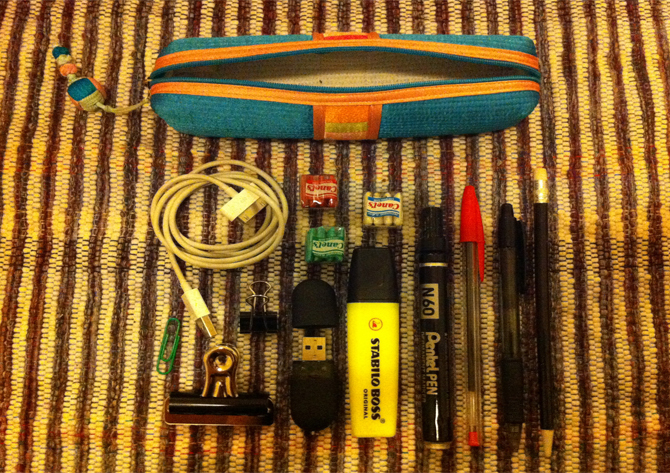 National Stationery Week: what’s in your pencil case? You know how we (Ok, I) am about stationery and all things related, we couldn’t let National Stationery Week go by without celebrating. 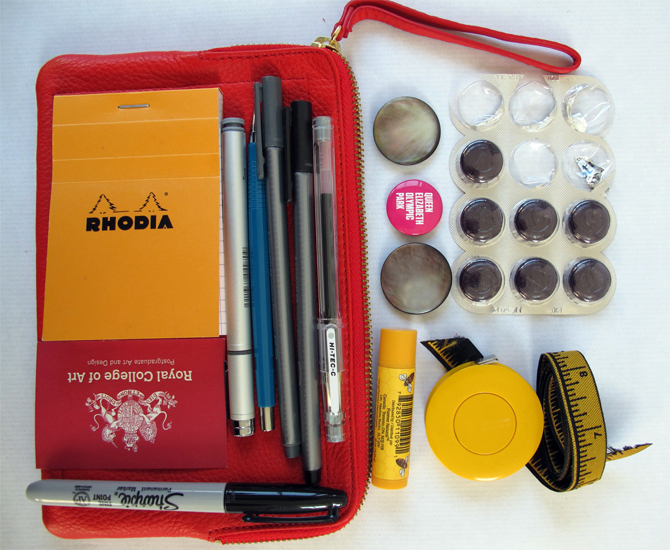 So we’re taking the opportunity to look into the pencil cases of some of our favourite stationery geeks (looking into people’s handbags is so very ‘last year’). I’m a bit worried about the demise of the pencil case. Hardly anyone has one now, even journalists, because everyone writes/records or communicates through their mobiles and computers. Soon we’ll forget how to write or construct sentences using over 140 characters….The internet has a lot to answer for. But due to its general loveliness, stationery will always have a following. Indeed emerging countries such as India and China are seeing a dramatic rise in luxury writing equipment due to the newly rich wanting old-school luxuries such as Mont Blanc pens and personalised paper. Louis Vuitton has opened Cabinet d’Ecriture, it’s pop up celebrating all things stationery in Paris and last year Rymans reported an increase (10%) in the sale of fountain pens, as did Amazon. Perhaps there will be renewed interest in pencil cases to keep all these smart pens in, although going by our examples, there’s a morphing of make up and stationery in most, as well as sweets…. Where’s your pencil case from? From Gap. It’s red leather and was a birthday present from Best Friend last year. Not really meant to be a pencil case, I suspect. What’s in it? Pens: assortment of black and grey. 2 x Staedler triplus fineliners, 1 black, 1 grey. 1 flashy grey thing in ‘cool grey’, 1 x Pilot Hi-Tec-C in grey. 1 x black Sharpie for writing on shiny things (usually packing tape). Other assorted pencils. Small notebook, squared paper. Get panic attacks if I leave the house without something to write on and at least 2 pens. 2 vintage buttons. Not sure why they’ve migrated here instead of in the button tin. 1 ‘Queen Elizabeth Olympic Park’ badge. Again, not sure why it’s in the pencil case. Fragment of ribbon woven to look like a tape measure. No idea other than vague magpie-collecting tendencies, which would also explain the previous 2 items. Business card of very nice chap I met from the RCA. Blackcurrant Strepsils. Leftover from last teaching session in Falmouth when I was coming down with a cold. Will stay in there until they go soft, squishy and leak. Surprised there’s not also a packet of ibuprofen. What should be in there and isn’t: calculator. MIA. Please mention how I CANNOT EVER write with a blue biro. Is it right to mention that people who do write with blue biros go down ever so slightly in my estimation? Black biro is fine. 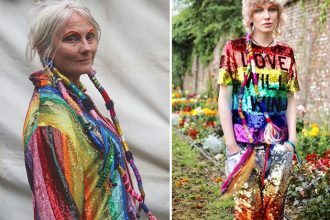 Well, any other colour is. Or will that make me sound like a complete nutcase? Blue biro really does make my skin crawl though. Where’s your pencil case from? I know what you’re going to say and it’s true to say that this is less pencil case and more hamper but then I am quite serious about my stationery. It was from Haynes Lane market in Crystal Palace – an absolute treasure trove. What’s in it? The iPhone has replaced a lot of my day to day stationery but I still use Rollbahn notebooks and muji’s wooden biros. Technology has made stationery more indulgent and considered so these days it’s more of a sit down affair for me. Essentials in my kit include washi and double-sided tape for gift wrapping, origami papers, sealing wax, a scalpel (i prefer a 10a blade), a selection of manila envelopes (waxed ones from merci are a highlight), the electric pencil sharpener (I cannot abide a blunt pencil) and a selection of rulers as the Muston family motto is ‘Measure twice, cut once’. Other highlights are the white Parker pen which my mum bought me when I was allowed to start writing in pen as an alternative to those awful Berol handwriting pens. Also the rose metal book markers (from RSVP in mitte, Berlin) and the brass corner pencil holder (from a shop in Silverlake LA). Also… Someone last night told me that Catbird in Brooklyn sells candles which are scented with pencil sharpenings and have some set in the wax – sounds awesome!! Where’s your pencil case from? 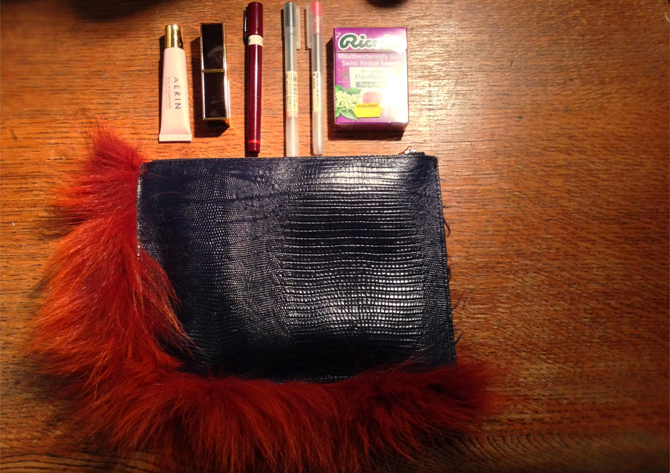 My pencil-case-slash-make-up-pochette is by Kite Eden and goes everywhere with me. (It’s like the grown up version of those furry pencil cases from school, no? Where’s your pencil case from? From Rymans, I have about six of these and lose them around the studio so this is my current case. When I am in a panic drawing or working its great to have a see-through case that I can easily see what’s in. What’s in it? I can’t live without a 0.5 /0.3/ 0.1 UniPin fine liner for my floral drawings, pencils rubber and finally I have found the DREAM sharpener from Japan, which I have been searching for. My daughter Violet collects these “kawaii” erasers and now has so many I have stolen some! This NICE biscuit is my favourite type. Where’s your pencil case from? The pencil case is Kate Spade and made from leather. What’s in it? 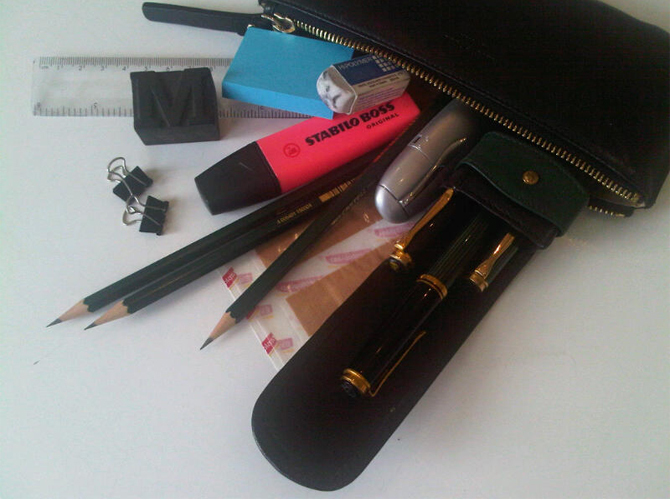 Gosh looking in my pencil case is about as intimate as my handbag! 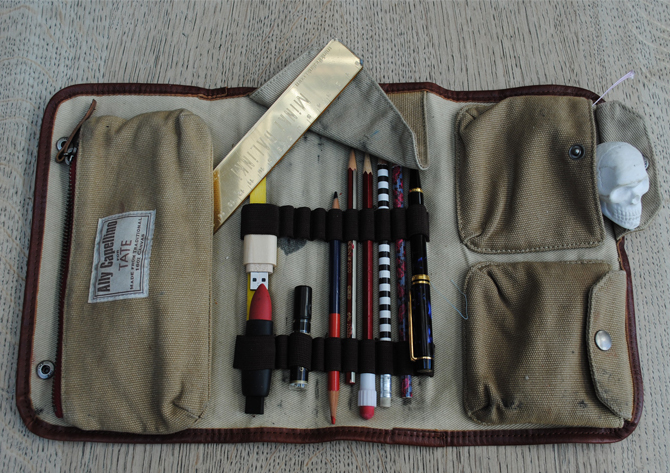 Inside my pencil case is a pen case which holds my Pelikan fountain pen – the same one I learned to write with over 45 years ago and still use daily. Mini post it notes, mini bull dog clips – I hate staples! A data stick, eraser and plasters for those paper cuts! Where’s your pencil case from? So, the pencil case was bought for me by my elder sister when she was in Tokyo a couple of years ago. It’s probably a bit nice to be a pencil case, but I was travelling a lot for work at the time, so it was pressed into service! A black gel pen – never blue, never a biro – because I think they write smoothly, and the black is really black. I never write with a blue biro. A red biro, however, is essential – I use it for hard-copy editing, like a teacher! Black felt-tip, usually for writing addresses on boxes of online shopping returns, or colouring in scuffed bits on black shoes! Where is your pencil case from? 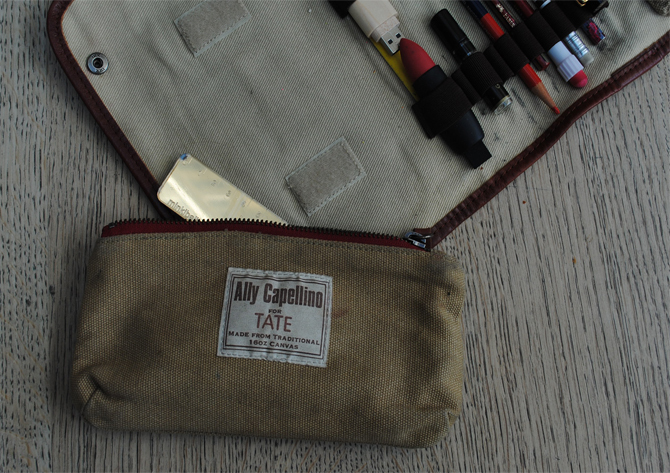 Ally Capellino for TATE, it is like an expedition pencil case, I could grab it and go down the Amazon at a moment’s notice, It is quite big, but has a clever smaller case which is velcro-d on so you can detach it easily, downsizing for your handbag. What’s in it? Pencils, almost always with erasers on the end (the only type I buy) freshly sharpened on my electric sharpener. Also my smart Waterman retractable pencil, for when I need to impress with my equipment. A Mitsubishi vermillion/prussian blue correcter pencil. Two USB sticks -including my favourite Avon lipstick one. My Minki Balinki gold reflective ruler. Perfume (obvs) currently I’m carrying Grossmith’s Golden Chypre, but it changes all the time, and a nail file. My skull eraser, which I bought in Venice and I wish I’d bought more, they make great gifts. Unseen but in the pockets….a penknife, post it notes, scissors and a mobile Kaweko Sport fountain pen and my beloved retractable Pilot fountain pen, currently with purple ink. I do not own a blue biro. So, blue biros are the stationery equivalent of the onesie and Muji and the Japanese generally are a pretty safe bet for good buys. Happy National Stationery Week! 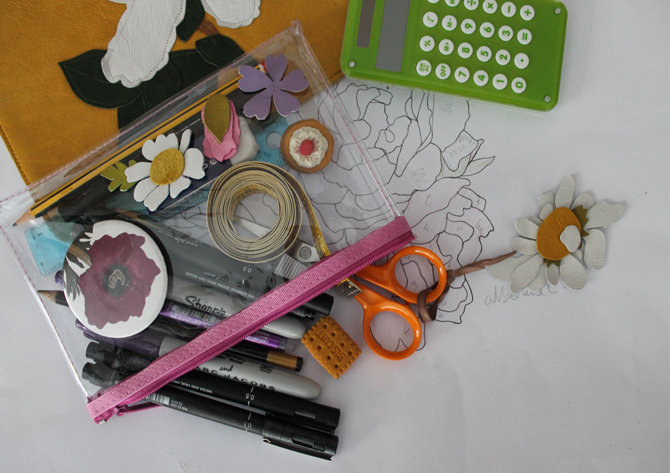 What’s in your pencil case? I love this post – but it is slightly scaring me. Are you all Virgo’s? I must become neater and learn form these things of organised beauty. I agree on the blue Biros – they are just wrong! As for Francesca and her hamper – pah ! Cheat! I could do an entire room of washi tapes, wrapping paper, origami paper etc! I never lend, either. And I’m not a Virgo. had no idea anyone other than the passport office hated blue biros! I write with whatever is in one of the many mixed pots of pens and pencils dotted about the house or rolling about the bottom of my bag. BUT I do have the most brilliant little leather case case from manufactum that fits in the palm of your hand and contains a mini biro and fountain pen from kaweco. I carry it everywhere but only seem to use it for special occasions. must get it out more. 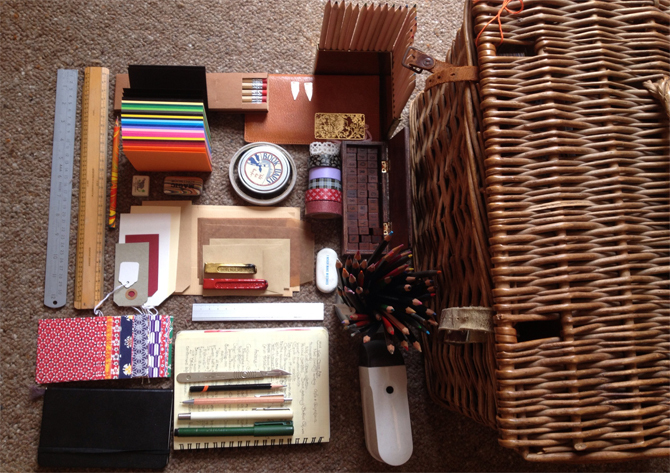 I’m a Capricorn (you know “shy, quiet, retiring”- ahem) and have a severe case of pencil case envy (a hamper!!). Can’t tell you how many people I meet tell me that they’re a “stationery fiend/ freak” and that they love hand printed stationery – how come I’m not rich then? I think you need to start a ‘what’s in your pencil case’ pinterest board. I want to play!